Claude Monet is one of the most famous artists in the history of painting. This French Impressionist was born in 1840 in Paris and studied at the Academie Suisse. It was one of his works that gave this art movement its name. 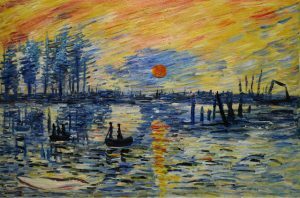 ‘Impression of a Sunrise’ focused on capturing light rather than detail and critics picked up on this, dubbing the style ‘Impressionist’. As a child, Monet and his family moved to Le Havre and while he studied well, he always preferred to be outside. His artistic talents became clear when he was young. He became known for his caricatures of the residents of the town. When he was young he met Eugene Boudin, known for his landscape paintings and he was influenced by his work. Monet was keen to include the natural world in his art. He started to paint outdoors and this was a key feature of his later work. He moved back to Paris in 1859, where he met his fellow Impressionists, including Camille Pissarro, who became a good friend. Renoir, Bazille and Sisley often joined him to paint outdoors. In 1865 his work was accepted to the ‘Salon’ and while there was some praise for his style, he was still struggling financially. Further works were accepted at the Salon, including a painting of his future wife, Camille. Monet’s financial struggles made life hard for the couple, particularly after their son was born and his depression led to a suicide attempt in 1868. However, he found a patron in Louis-Joachim Guadibert, which gave Monet the means to work on his art while his family was supported. He painted in London and Venice, among other places and when he returned his family to France in 1872, he made his home at Argenteuil. His most famous works are those of the water lilies, still exhibited around the world today. He died in 1926.